Game Directions: Have the class form a circle. Choose one child to be a leprechaun. The leprechaun marches around the inside of the circle. At the end of the second phrase the leprechaun stops in front of a child. They join hands and they “jig” – left heel forward, right heel forward, etc. The children in the circle should do a “sailors hornpipe” at the same time (fold arms and jig in place). Now two children march in the inside circle. They choose two more partners and jig again. Continue with four, then eight, until the entire class has had a turn. A video of the St. Patrick’s Day Jig that is played the same way is included in the Musicplay Digital Resources and on www.Musicplayonline.com. Use the search engine to find St. Patrick’s Day Jig. Went to school with nothing on. Teacher said, “That’s not fair! Suggestions: Have the children take off one shoe and step the beat while they say the leprechaun poem. The foot with the shoe on will make a louder noise, and will emphasize that that beat is accented.Have the children take off one shoe and step the beat while they say the leprechaun poem. The foot with the shoe on will make a louder noise, and will emphasize that that beat is accented. For example: Will you please be fair? or Leprechaun had nothing on! – Choose non-pitched instruments and have a small group play the ostinato on instruments while the rest of the class says the poem. 3. Review families of classroom instruments: metals, woods, drums, shakes and scrapes Try playing the poem on each instrument family. Try playing one line 1 on metal, 2 on woods, 3 on drums, etc. 4. Have the class circle or underline words in the poem that they feel are the most important. In your class, students could use different colored markers to underline words. 5. Choose rhythm instruments, found sounds or body percussion for each highlighted word. Play and say the poem using all the rhythm instruments that you’ve chosen. 6. Just play the poem – think the words. Class set of iPads? You can get discounted prices on apps! Our new online resource is coming along really well. It’s free to use until Aug. 1, 2016, so try out the games, songs, activities while it’s free! 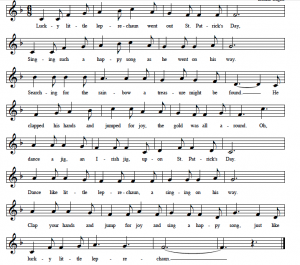 – printable worksheets, class big book templates, for many, many songs! – guitar is coming soon! This entry was posted in St. Patrick's Day on March 1, 2016 by Denise Gagne.